MP Julian Huppert found a treasure trove of children’s toys when he visited the winner of this month’s Discovering Cambridge competition. The Cambridge Toy Shop in Sussex Street opened in 2004 and is run by Vivienne Watson. A loyalty card and deliveries by cycle courier are also available and weekends often see face painting and displays. 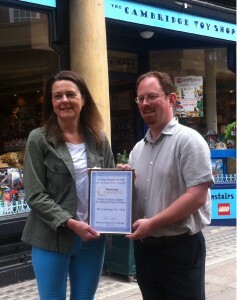 The runner-up in the category was the online children’s retailer, Happy Humbugs in St Matthews Gardens. 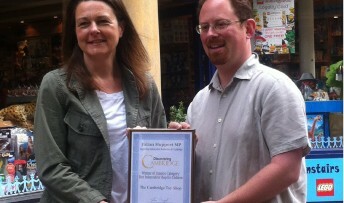 Discovering Cambridge was launched to celebrate the city’s best independent traders and in July Julian will be asking for nominations for the best independent pub. Nominations can be sent to Julian on Twitter @julianhuppert or Facebook, by email atjulianhuppertmp@gmail.com or by post to Discovering Cambridge, Julian Huppert MP, 16 Signet Court, Swann Road, Cambridge, CB5 8LA. Each month Julian will ask for nominations in a different category, a monthly winner will be chosen and an overall winner will be announced at the end of the year at the Mill Road Winter Fair.